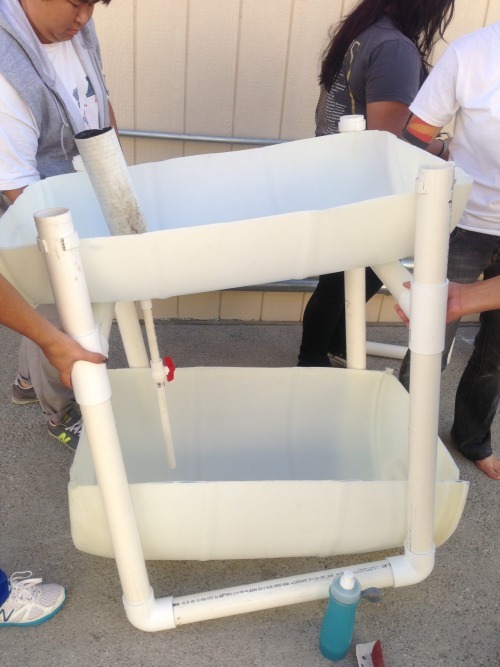 curriculum developed by student leaders and guided by Professor Erika Catanese under the direction of Dave Douglass, Ph.D.
Pasadena City College Aquaponics team is a part of the eSTEM program. We work in conjunction with a federally funded STEM (Science, Technology, Engineering, Math) program as well as the Southern California World Water Forum (WWF) College Grant Program. The WWF collaborates with The Metropolitan Water District of Southern California, the U.S. Department of the Interior Bureau of Reclamation, Sanitation Districts of Los Angeles County, Water for People, and Friends of the United Nations. In recognition of these outstanding achievements, Pasadena City College Aquaponics is proud to announce the availability of the PRESIDENT’S VOLUNTEER SERVICE AWARD, a prestigious national honor offered in recognition of volunteer commitment. Established in 2003, this new AWARD is given by the President of the United States and honors individuals, families and groups who have demonstrated a sustained commitment to volunteer service over the course of 12 months. Pasadena City College Aquaponics has teamed with hundreds of organizations and businesses across the country to deliver this Award to our most outstanding volunteers. As a Certifying Organization of the PRESIDENT’S VOLUNTEER SERVICE AWARD, we can nominate potential recipients and distribute the Award to those who meet or exceed the AWARD criteria. Children, adults, families and groups can receive the AWARD and, given their ongoing service activity, many of our volunteers may already meet the requirements. To qualify for the PRESIDENT’S VOLUNTEER SERVICE AWARD, volunteers simply submit a record of their service hours to the Aquaponics Leadership Team, and we will verify the service and deliver the AWARD. Volunteer service hours are not limited to those performed on behalf of PCC Aquaponics. In fact, service hours can be accumulated through work on a variety of projects throughout the year. The only requirement is that the necessary hours be completed within12 months; recipients can qualify for a new AWARD each year. The PRESIDENT’S VOLUNTEER SERVICE AWARD is issued by the President’s Council on Service and Civic Participation – created by President George W. Bush to recognize the valuable contributions volunteers make to our nation. To learn more and find out how to qualify for the AWARD, contact Olivia Zanfardino, our AWARD administrator, at pccestem@gmail.com or visit www.PresidentialServiceAwards.gov. lifetime are eligible to receive the PRESIDENT’S CALL TO SERVICE AWARD. Join us to learn about Aquaponics! Today, biology majors designed experiments testing resource partitioning and diversity of Protistans living in Aquaponic fish tanks. Eduardo, a leader in Pasadena City College’s Aquaponics Program, powers the aquaponic barrel system by bike. Pedaling the bike Produces DC energy which then is converted into AC energy by an inverter, which is connected to the water pump that starts up the aquaponic system cycle. A video overview of the Aquaponics Group’s 2-day build and installation. 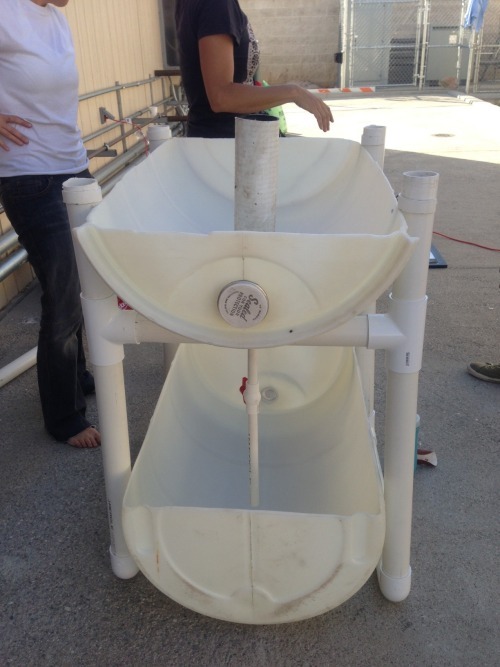 Watch as we build an aquaponics gardening system at the school. The system will use less water and produce more produce that will be sold through a social entrepreneurship to support St. James’ Episcopal Church’s soup kitchen and food pantry. The eSTEM Aquaponics team has been busy kicking off the new school year by setting up prototype aquaponics systems in the Science Village. System designs include a vertical (gutter) system, barrelponics, hybrid design, and media bed design. The Aquaponics team works to increase our leadership skills, our resume building, and the practical application of STEM technologies. Our goal is to provide a tangible method of food production that any resident in any living condition can be a part of. Our projects include engaging with local government to fund and maintain solutions to food and water scarcity, educating our community on growing their own food with minimal supplies, and sharing technology with the growing global aquaponics community. After a long day of construction and teamwork, the student leaders stand proudly with the prototype of their first grow system! After months of learning, research, and planning, the Aquaponics students leaders were finally able to begin the building! They spent their weekend putting together their plans to grow their first Aquaponics grow system. With their great teamwork and positive attitudes, the system finally began to take shape and come to life. Up next? It’s Grow Time! You can see their work outside of SV-23! Have you ever operated a power tool? For the majority of the Aquaponics student leaders, the answer was no. However, that didn’t stop them. After a quick training on how to safely operate the tools, the students revved up and got to work. Slicing and dicing, the Aquaponics leaders had no problem getting comfortable and enjoying the tools’ speed and power. Aquaponics student leaders spent their weekend in PCC’s Science Village to begin the building of their first Aquaponics growing system. After weeks of research and meeting, the group took their knowledge outside and began the preliminary plans. Together they thought, discussed, and planned how the system would look and what steps they would take to get there. Their close attention to detail and thoughtful planning process will surely pay off during building time! The Aquaponics student leaders have been meeting weekly to research, discuss, and plan their first aquaponics system. With the guidance of Professor Catanese, the research on Aquaponics and how to build a successful system has been completely student-driven and self-taught. (From Left) John Dorusinec, Antonio Garcia, Steven Luong, Thang Lu, Flor Calderon, Carla Gonsalez, Yuyang Duan and Aris Arakelians Hamparsoomi.